Easy sourdough bread recipe means a starter of yeast and healthy bugs. Easy sourdough bread recipe gives you a little variety when it comes to your baking; the taste is rather more acid and to some folk's liking, but not others. What starts out as a little experiment may turn into a passion, or you may not like it at all. Personally, I make it most of the time now; it's my favourite standard bread recipe. Let's start first up by saying this is really not a complex process. It seems, if you read books and magazines on the subject of sourdough breads, that it's a whole lot of mystery, and not a little schlep, in the making; that's bunkum. But it's easier perhaps to get a starter from a friend. Both wheat and rye naturally have fermenting yeasts and bacteria. Add some water, and warmth, and they will start to feed on sugars released from the flour by their own enzymes, producing carbon dioxide and leavening the dough. This is the way bakers have made their bread for millennia, without the use of industrial yeast. I won't say that it is necessarily better; it's just different. Having said that, researchers have now found that sourdough breads, given a long fermentation time are far more digestible to those who are gluten intolerant, including those with Celiac disease. And I'm personally finding much less indigestion after enjoying this loaf. Read more at does flour go bad? Easy sourdough bread recipe takes less than ten minutes to make. 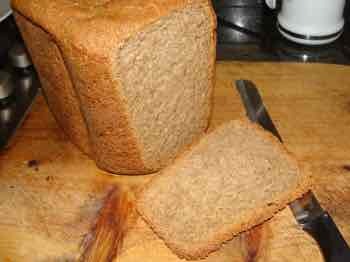 Perhaps you have oodles of time and make your easy sourdough bread recipe from basic principles. Or perhaps, like me you are a busy person; then let's use the baking machine. It will take you less than ten minutes, plus of course five hours for the yeasts and bacteria to do their thing. Let's start with the care of your starter. You will need an approximately 500ml container; I'm using this feta cheese bucket. Make sure it's properly clean before use. The bacteria and fungi in the starter will produce gas, so the lid keeps popping off. That introduces smells into your fridge, and you risk getting your sourdough contaminated. So you need a second container that is large enough to house your smaller bucket. That's it at the back on the right. Don't use a glass container, or you may find shards of glass shrapnel flying through your fridge door! 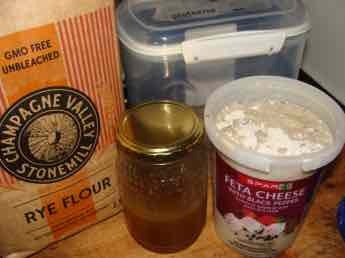 The bugs are much happier with rye flour, so even though you are basically making a wheat bread, you will need a couple tablespoons similar to this Champagne Valley stonemill product every couple days. Then, if you want to be really swish, adding a teaspoon of raw honey to the culture is the German way of producing a 'back ferment'. The supermarket pasteurised honey is quite useless; raw honey contains an abundance of natural yeasts producing a vigorous fermentation. You may have to find a local beekeeper; read our raw honey page. It's been the hobby of my lifetime. Whenever you make your easy sourdough bread recipe, every second day in our family, you remove a roughly half cup scoop (125ml) of your starter and add it to the flour in the baking tin, reducing the commercial yeast by a third. To the starter, you then add a roughly equal amount of rye flour and water, and a teaspoon of raw honey. Stir it up, put on the lid, and put it in the sealing container, and return to the fridge. Do you best not to contaminate your starter with fingers, or whatever. So in fact, I don't even bother with stirring in the rye, water and honey; just tip them in, and then you don't have to clean a stirrer, and are tempted to scrape it off with your fingers. When baking normally, the water quality isn't really important. However, when making your easy sourdough bread recipe, chlorinated water will destroy the natural bacteria that you are wanting to encourage. We use only rainwater in our home, but you could use bottled spring water. Then just get on and make your bread in the normal way, remembering to reduce the commercial yeast slightly. I follow this panera bread menu recipe. If you have weight problem and want to reduce the glycemic index of your bread, you can instead follow our low GI bread recipe. Baking your own bread also gives your more control of the amount of salt in your food; our loaf contains less than half the amount in store bread; no sugar, and none of the dangerous chemicals. We rather use honey; how to start beekeeping is one of the rages in the world today; it's hard physical work, not a bad thing, and very relaxing; just what our stressed minds need. Grinding your own healthy flour for your easy sourdough bread recipe improves the nutrition immeasurably. The fats in wheat start to oxidise, go rancid, the moment you crack the kernel, letting air in; in particular, the invaluable vitamin E is affected. Grinding your own flour will reduce the cost of your flour by a half, or even more, increase the nutritional value many times, and takes about one minute. An electric flour mill is an essential if you're serious about baking your own bread. But the wheat grinder is expensive; throw in the saving by not having to buy vitamin E capsules and it becomes viable. Add to that the betaine found in 100% healthy flour, calcium and fibre, and you'll realise that a wheat grinder is not such a daft investment; I'm convinced it's one of the reasons we enjoy a life without medication. Once you've looked at the whole wheat vs whole grain controversy, you might be convinced of the merits of buying your own wheat grinder. Ours is used at least five times a week.It gives you more options when you start to enjoy making bread experiments. Healthy choice foods are not optional for those who have no desire to take drugs and regularly visit doctors; this is the medication that keeps your body healthy. The body absolutely needs a colon full of healthy bacteria; this easy sourdough bread recipe is one way to help achieve it. Without the phytochemicals in your vegetables and fruit, the healthy fats in olives and avocados, nuts and seeds, and the omega-3 in fatty fish and flaxseed, for example, you simply will not be a healthy, strong person. Besides which, your healthy choice foods taste fantastic once you've educated your tongue about the virtues of sourdough bread, for example, smeared with just butter; I can't bring myself to put jams and jellies and even raw honey on it. It's so delicious. And what may surprise you is that despite this being midsummer with corn on the cob and new potatoes being enjoyed daily, neither Helen nor I are putting on weight. 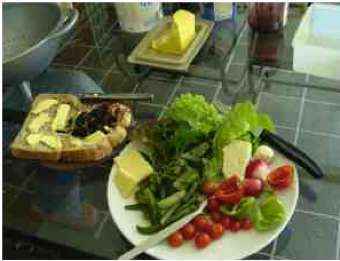 With a lunch like this you can enjoy as many starches as you like. That day I had homemade mulberry jam on my sourdough bread. Having said that, we never eat white bread, or refined rice, or drink colas; it's the high GI carbohydrate that makes us obese, not healthy flour products. How to make mulberry jam. I'm serious that, having got started and into a rhythm, this easy sourdough bread recipe takes less than ten minutes to throw together, including grinding the wheat and feeding the starter; in fact, it's nearer five. Understand the meaning of gluten and you are ten steps ahead of your neighbour when it comes to the health benefits of sourdough bread. Bernard Preston as a semi-retired chiropractor writes in his personal capacity on the virtues of healthy living. Quick and easy to produce bread using healthy flour is one of his passions; as is experimenting with different formulae such as this easy sourdough bread recipe. Abundant living, he would say, and full speed, stopping to replenish the body and spirit periodically; then you won't spend twenty years in an old age home losing your marbles. Healthy choice foods is what the brain and the body need to achieve an optimal peak of long, fruitful years; and exercise too, of course.